This case study, prepared by the Health Innovation Forum with the collaboration of Johanne Desrochers, Associate Director of Telehealth at the MUHC, examines how the MUHC's Telehealth program served as the starting point for creating a virtual health and social services network. — Produced as part of the MUHC-ISAI's 2010 program. Providing specialized health services to people in remote regions is an ongoing challenge. The number of specialists and subspecialists is limited and the volume of practice outside major urban centres is insufficient to maintain skill levels. Academic health centres have traditionally provided consultation services to remote regions on a voluntary basis. In the province of Québec, this situation changed with the 2005 healthcare reform that created four integrated university healthcare networks (réseaux universitaires intégrés de santé or RUIS) and made each RUIS accountable by law for rendering specialized services accessible to everyone in its territory. Telehealth is regarded as a strong driver in the network’s affairs, as it intensifies cooperation between network partners and improves coordination of resources and activities. 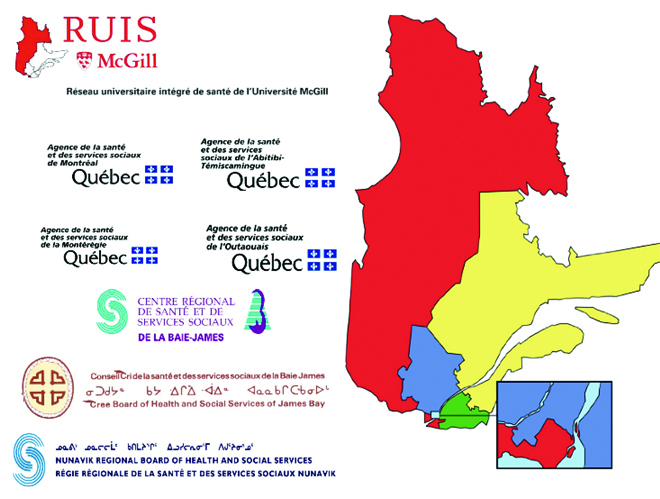 The McGill RUIS Telehealth Network is governed by the McGill RUIS. The RUIS Centre of Expertise and Coordination of Telehealth (CECoT) is the operational arm of the CvSSS, acting as the single entry point of all requests for telehealth services, and supporting telehealth activities. A steering committee with representation from all the regions was set up to define needs and priorities. It identified four RUIS-wide priority areas for access to specialized telehealth services: cardiology, oncology, psychiatry and obstetrics. Four RUIS clinical committees, made up of experts from the university-affiliated hospitals and the RUIS regions, were charged with defining the offer of specialized services within their field of expertise that will be made available through the CvSSS. Each committee must identify the subspecialties available among the RUIS experts in various health centres, and determine whether telehealth is an appropriate solution for the specialized services requested in the referrals. As well, the committees must try to estimate the volume of service requests expected to come from each region to support decisions about where to offer a given telehealth service. Finally, the committee must provide input into the balanced scorecard that will be used to evaluate the benefits of these new services. The clinical committee comes up with a final offer of services that is very concrete and looks essentially like a schedule for virtual clinics. Appointments are scheduled through the Coordination Centre (Figure 2), much in the same way that traditional referrals are made. Some of those clinics may be offered from regional hospitals. “If the hospital in Val d’Or wants to expand its offer of services in obstetrics, it will fall on the clinical committee for obstetrics to define what support is expected from the RUIS network to do that,” says Ms. Desrochers. Once a committee has written the content of what will be available in the virtual health centre, Ms. Desrochers’ team is then responsible for organizing its delivery. In oncology, the RUIS involves three radiotherapy centres: the MUHC, the Jewish General Hospital and the Gatineau Hospital. They work together to provide services to patients throughout the territory. Telehealth expands collaboration in both direct patient care and education. “The MUHC runs weekly educational teleconferences attended by all doctors in the three centres ” says Dr. Freeman. Videoconferencing is also used for regular tumour boards, at which specific cases are examined by a multidisciplinary group. “These are especially valuable for very rare tumours, where expertise is concentrated in one or two urban centres,” adds Dr. Freeman. In the provision of treatment, the academic health centres work with regional centres to enable patients to receive as much of their treatment as possible close to home. “They come to Montreal for their work-up and surgery, but then receive a component of their treatment elsewhere,” says Dr. Freeman. “We can assure the same quality of care because we continue to be linked with other clinicians and provide support.” She emphasizes that the point of the RUIS structure is not to centralize care but to treat the patient well as close to home as possible. Referring doctors are asked to complete a ‘Web’-referral form, which is then forwarded to the Coordination Centre. The incentive for them to take on this task is that they receive a full electronic report from the consult within an hour of it being completed. • The number of participating sites grew from under 1,000 to 4,500. • The number of videoconferencing sessions grew from 306 to 1,505. • The number of clinical consults using videconferencing increased from 53 to 495. From 2008 to 2009, there was a 41% increase in real-time clinical consults and a 48% increase in educational sessions: 53% of all videoconferencing activity is in education. 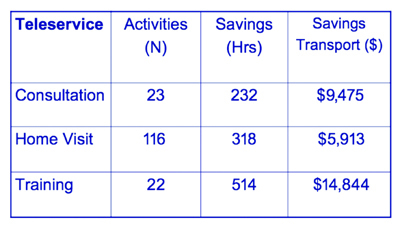 Figure 3 shows a preliminary view of the savings, in both dollars and hours, arising from telehealth activities. In the CvSSS, professionals provide their services as part of a network rather than a particular hospital. “That is a major paradigm shift,” Ms. Desrochers emphasizes. Doctors need to leave competition aside when they enter the telehealth world and move from an individual provider or hospital mentality to a network effort. Ms. Desrochers’ strategy is to forge ahead with the early enthusiasts. She recruited them onto clinical committees charged with defining the service offer in each of the four specialties identified by the regions. She appointed co-directors from different hospitals for the clinical committees to try and cultivate a new network culture. Mixed remuneration models within an academic health centre make it easier for doctors to free up time for telehealth, as they can use the administrative or teaching time allotments for telehealth activities without losing money. The workflow needs to be as natural as possible. “It all has to be made easy for the patient and both treating teams,” says Dr. Freeman. The Telehealth Network recently received a budget from the Ministry to hire a clinical coordinator for each of the four specialty programs. The role of this clinician is to serve as the point person to receive the referrals, determine the urgency, ensure that the clinical information on hand is complete enough to set a date for consultation, and decide who should provide the consultation. “In oncology, we found a nurse with expertise in telehealth,” says Ms. Desrochers; “in obstetrics, we have a senior obstetrical nurse as coordinator.” They are just now beginning to define and develop these new network jobs. To fulfill its offer of service, the MUHC Coordination Centre needs to increase its capacity to respond to requests for consults, but also has to help increase local capacity in the regions. It therefore provides remote training to all telehealth users in the remote communities. But the manpower shortage is so significant that they are increasingly favouring systems that can be controlled from Montreal. When Ms. Desrochers took on the telehealth mandate at the MUHC, she secured sponsorship for upgrading pediatric services from Operation Enfant Soleil. Bell came on board with a 10-year sponsorship beginning in 2007, to support building a virtual health centre that would serve the northern communities. Ms. Desrochers used the small operating budget provided by the MUHC to begin to offer services on the adult sites. A sustainable model for governance and financing telehealth across the RUIS was proposed by the Network to the Ministry in 2007 but has not yet come into force. However, the infrastructure and processes that are being set up through the CvSSS to fulfill the requirements of the four priority programs will be the foundation upon which other telehealth programs will be run in the future. There is some concern at the Montreal regional board of health and social services (Agence de la santé et des services sociaux de Montréal) that wait lists will increase for Montrealers’ access to specialists if they devote more time to telehealth work. One ongoing challenge is to ensure that physicians in the regions are participating in telehealth program design and initiatives. The educational component is very important. The psychiatry group is offering a series of educational lectures, to be delivered via videoconferencing, to enable broad participation by regional providers. “We are now looking at that in oncology as well,” says Dr. Freeman. Dr. Paul-Emile Barbeau, a general practice physician serving First Nations communities in Abitibi-Temiscamingue, describes telehealth consults as fantastic support to professional practice and continuing medical education: “I discuss with the specialist which protocol he decides on and why.” Consults also allow him to provide better and faster care to his patients. Ms. Johanne Desrochers co-chairs the development of Telehealth for the McGill University Integrated Healthcare Network. The leadership of the MUHC program is situated at the Montreal Children’s Hospital, where Ms Desrochers is the administrator for the Northern and Native health program and the paediatric outreach services. 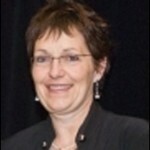 She is active in many sectors of the Health and social services network, sits at the clinical advisory committee for the Quebec electronic health record (DSQ) representing the Quebec Order of Nurses (OIIQ). Ms. Desrochers has a bachelor in nursing from the University of Calgary, holds a certificate in community health from the University of Québec in Trois-Rivières, and a Master of Science degree, in Health Administration, from the University of Montreal.